The time has come to stand up for what’s right in America. We may be in the middle of economic recovery, but millions of Americans are not sharing the benefits. The growing ranks of those without adequate food, jobs, shelter, or health care challenge our fundamental notions of right and wrong. America Needs Human Rights makes a powerful case that both the letter and spirit of universally recognized human rights are routinely violated in America by government policies that safeguard profits rather than people. Topics includes understanding human rights, basic needs and human rights, the new American crisis, poverty in America, welfare reform and human rights, policy options, and movement building. See also the companion DVD America Needs Human Rights. 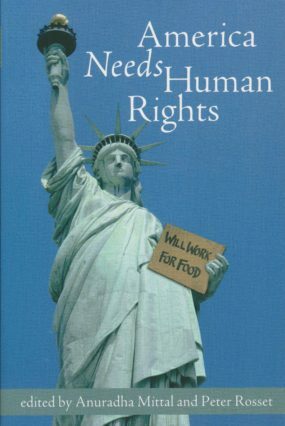 America Needs Human Rights provides a cogent analysis of fundamental problems that disfigure our society, along with guidelines for addressing them in a constructive way. It is are accessible, informative, and compelling. As the first group of poor people who marched under the banner of Economic Human Rights in the United States, we declared that welfare reform was a violation of our human rights. America Needs Human Rights is an important tool to educate America and the world around us of our very real need for human rights. I have seen hunger and starvation emerge as primary weapons used to rob entire populations of their will, their dignity, their health, and their freedom. All persons of good will and democratic ideals must recognize food security as one of the great challenges of the next millennium. America Needs Human Rights places economic justice and food security at the forefront of the struggle for universal human rights.